Last night, I, along with everyone else in America, watched Downton Abbey. It was good to return to the country house for another visit, and we all breathed a sigh of relief when Matthew and Lady Mary finally got married. The world is now at peace, except for all of those new problems that the year 1920 brings to the inhabitants of Downton. I love the show, partially, because I am a history buff. This particular period of British history, those years between the wars, is one of my favorite, so seeing it come to life makes the show worth watching for me. Julian Fellowes, the show’s creator, does his historical homework in crafting his narratives. As a historian, I spend every episode ticking off what’s going on in world history at the time and trying to spot Fellowes’s historical allusions. My favorite bit from last night was Isobel Crawley’s pet project to aid women who had “disgraced themselves.” It dovetailed well with Evelyn Waugh’s picture of British post-war prostitution in Decline and Fall, which I had just been reading earlier. But in spite of its glitter and glamour and attempts at historical accuracy, let’s be honest, Downton Abbey is just a soap opera. The situations that Fellowes writes for Downton don’t always ring true. Series one, Mr. Pamuk. Series two, Lord Grantham’s affair that began and ended in one episode. Last night was a twofer, Lord Grantham’s financial disaster and Matthew’s problem with accepting his inheritance from Reginald Swire. Downton Abbey is a house populated by stereotypes. The haughty aristocratic daughter, the lonely-because-all-the-young-men-are-dead daughter, the daughter who cares about women’s suffrage and whatnot, they’re all there. All the types of cranky grandmothers. Longsuffering high-minded servants and conniving, grasping servants. And Lord Grantham, the out-of-touch aristocrat in a changing world. But last night the stereotypes played their parts too stereotypically. Matthew and Branson talk about their wives being so strong-willed, but those two men overacted every pigheaded scene that they were in. All the discussion about the differences between Americans and English also caused a bit of eye rolling. 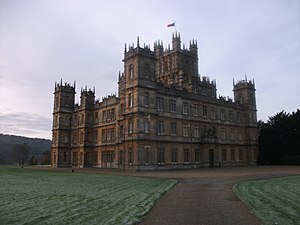 My biggest groan was when, to prove her Americaness, Lady Grantham told Lord Grantham, “Have gun; will travel.” The line was too American, and besides there was probably no way she could have said it. The line was in use in 1920, but it was only a couple of decades old by then, and wouldn’t become truly popular until the 1960s. As an American who had been living in England for at least twenty-five years, Lady Grantham probably would not know the phrase, and it is completely unreasonable to assume that her husband would understand the idiom. So that’s my take on last night’s Downton Abbey. I love the show, because I love history, Britain, and television, but I must admit that it’s just another soap opera. Let me know in the comments what you thought of last night’s episode. yes my only complaint about this season is the storylines go too quickly, too much like a soap opera. he is trying to say too much and make it quick to cater to the younger kids. it wasn’t right. I did like the American complaints – they were valid and we need to have a sense of humility now and then.